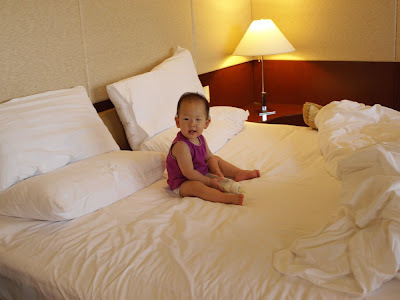 This weekend, we went to Taipei for a 4-day family vacay. We stayed at the Far Eastern Shangri-La Hotel which is fabulous: modern, clean, spacious, and it also had a great view! Here are pics of Natalie getting settled on our arrival. Natalie is cheerful and happy after two naps (one on the plane, one during the ride from the airport into the city). First thing's first, we give Natalie a bottle and she eagerly tries to drink. Then she realizes she has to lie down to get any milk out. Happy with a full belly, Natalie is feeling playful. She gives a little smile to the camera. 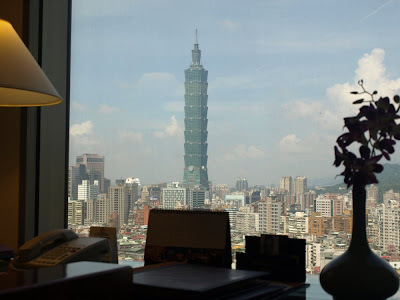 The great view of Taipei city and 101 from our room windows.